Brooch made ​​of cast brass and finished by hand with brass pin hardened by hammer. 4 cm external diameter, internal diameter 2.3 cm. XIII century. The glass paste stones and freshwater pearls are set by hand. It was drawn in the style of a brooche that is in the National Museum Wales and date from 1250 to 1320 -40. 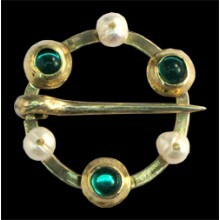 Many of these brooches were in use in Europe with shapes and combinations of stones and pearls.